Implants Nottingham is a dedicated cosmetic dental clinic that specialises in dental implant treatment in the region. With expert and highly qualified clinicians, you can expect to receive the very best care in comfortable and modern surroundings. For further information, please get in touch and speak with a member of our staff. Besides recent research into biological tooth replacement, receiving dental implant treatment is currently the only solution to replace missing tooth roots. One or more teeth may be lost at any point within our lifecycle, creating an imbalance in our dental structure. Dental implants are a means of replacing single or multiple tooth roots and anchoring a dental prosthesis such as crowns, bridges or dentures to restore tooth structure. At any time, we may lose a tooth due to dental decay, gum disease or accident. Dental avulsion may occur during oral injury, and the tooth with tooth root may be fully or partially knocked out. Dentists aim to save a tooth where possible by reinserting the natural tooth or through root canal treatment to remove infected dental pulp however it is now always possible to save existing teeth. Missing teeth may be replaced without having the tooth root restored with dental implant treatment. Bridges that attach to neighbouring teeth or crowns and dentures may be used to replace lost teeth however as the gum tissue changes over time these artificial teeth may become loose or ill-fitting. Dental implants are a way to secure teeth replacements without the concern of them becoming loose, sliding in the mouth, or falling out. Unlike bioengineered dentition that is produced from an individual's gum cells to grow a natural tooth root, a dental implant is usually made from artificial material such as titanium that is strong and resists corrosion better than most metals. The reason that titanium is used for dental and medical procedures is because low-density titanium easily fuses with bone through osseo-integration processes, becoming part of a person's natural bone structure. Where osseo-integration or bone fusion does not occur, the operation may not be successful. Therefore, alternate biological tooth replacement research is underway. However, all over the world many people receive successful dental implant treatment to replace lost tooth roots and teeth on either or both dental arches. 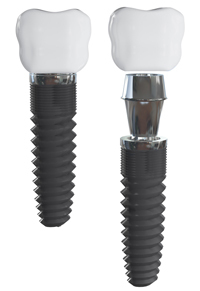 Dental implants are formed using titanium posts or screws which, during dental surgery, are inserted through the gum tissue into small sockets drilled into the jaw bone. A tooth restoration or artificial tooth is then easily secured to the titanium abutment. Before the dental implant operation, a dental implant expert uses digital imaging and x-rays to determine suitability for dental implant treatment and to take personal oral measurements for custom-making of dental implants. Nowadays, dental implant technology used is extremely precise so that dental implants fit perfectly for providing artificial tooth replacement options. Dental implants are made bespoke from an individual's oral specifications and are inserted under anaesthetic for pain-free treatment. Once inserted, the dental implants need time to fuse with the jaw bone. The process of osseo-integration may take several weeks and during this time, temporary replacement teeth may be provided. While bioengineered teeth are an attractive option because they mimic natural tooth development from embryo stage, the research is still in its infancy and individuals may not feel comfortable with the use of adult human epithelial or mesenchyme cells for custom-growing of bioteeth. The cost of treatment may be expensive too.